Anthony is an award winning webcaster, and he is the founder and general manager of Vidgle. Vidgle is part of Jenthony Enterprises, Inc.’s online media platform. He was named in his position in January 2008, he is in charge of the operations at Vidgle. Anthony came from WRAJ Internet Radio, in which he was the founder in 2002, making it the longest running commercial internet radio station in the New York market. Anthony continues WRAJ Internet Radio’s daily operations. Known around the internet radio industry, Anthony travels around the country speaking at streaming web conferences, Web 2.0 conferences, and broadcasting conferences. 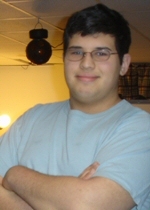 Anthony is currently the director of Con Goer, the popular video podcast series about anime and sci-fi conventions. He appears as a substitute reporter. In the convention community, Anthony is known for bringing video journalism to the convention scene to the web media and to mainstream media. Anthony is a graduate from Five Towns College in Dix Hills, New York; in which he majored in mass communication. When not busy on the radio or on the web, Anthony enjoys playing video games and traveling around the world. My name is Jonathon Ceballos, we met breifly after your crew interviewed my friend Ken Irons. You both were so cool! I was just wonder if I could add you guys to facebook? Cheers and thanks for being part of AAC this year!